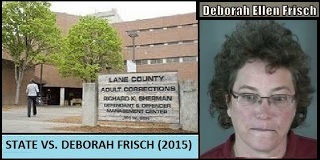 Eugene (Aug 19)--Oregon Criminal Deborah Ellen Frisch will face a judge for a court hearing today, according to Lane County Courthouse e-records. The purpose of the hearing is as yet unknown. Also unknown is the nature of a reference to a SECOND, concurrent, criminal court case for Debbie. Does this mean even MORE new charges are in the offing for Debbie's criminal behavior? Let's hope so!